As the largest of the ‘hotspot’ islands in Greece, Lesvos has been directly affected by the EU-Turkey Statement of 18 March 2016. Since its implementation just over two years ago, the island has transformed into a place of hostile containment. The direct effect of the ‘deal’ has been to prevent those who have irregularly entered Greece from continuing to the mainland. Applicants remain on the island whilst their applications for asylum are considered and determinations made regarding the suitability of their return to Turkey. Whilst we welcome Tuesday’s decision by the Greek State’s Council to lift geographic restrictions for new arrivals to the Greek islands, the practical application of this decision remains to be determined. Since the EU-Turkey deal was implemented, examples of deplorable reception conditions on the island of Lesvos include chronically overcrowded refugee camps and fatally inadequate housing which have, amongst other things, created a mental health crisis. These extreme problems are exacerbated by the myriad of issues associated with the island’s asylum procedures, which result in excessive delays and the increased likelihood that an applicant’s case is not properly considered. A policy of prioritising the applications of some nationalities whilst creating pilot schemes which remove the rights and procedural safeguards of others, also creates a hierarchy where black African communities finish at the bottom. All of this, with the spectre of return to Turkey – a ‘safe third country’ where mass refugee deportations, refugee child labour and the imprisonment of human rights defenders have become the norm. This situation is of the EU’s own making. These policies exist precisely to make it incredibly difficult for refugees to stay. The systematic breaches of domestic, European and International Asylum and Human Rights law in the hotspots makes it difficult to conclude otherwise. It is within this context that hundreds of peaceful protesters gathered outside of EASO in Moria on 18 July 2017, demanding that Greece and the EU comply with its own laws. Greek state authorities responded to the peaceful protest with violence. Humanitarian actors were evicted from the camp, which was put on lockdown. Police used quantities of teargas that made it painful to breathe even from outside of the camp. Clashes between riot police and a handful of protesters ensued though these did not last long. An hour after the disturbance had ceased and everything appeared calm in the camp, armed riot police entered Moria. They targeted and violently raided the ‘African section’ of the camp: forcibly entering isoboxes, dragging people out, shooting teargas at close range, and brutally assaulting people, including a pregnant woman. 35 people were arrested in this violent, arbitrary raid. We have previously reported on the graphic and shocking details of the arrests, which an Amnesty International report concluded could have amounted to torture. Despite the Greek Criminal Procedure Code describing pre-trial detention as a ‘measure of last resort’, 30 of the 35 defendants have been detained since their arrest on 18 July 2017, within four different prisons spread across Greece. This is despite the weakness of the evidence against the defendants; well documented concerns regarding their physical and mental wellbeing; the near impossibility of their leaving Lesvos; the absence of previous convictions; and the absence of any evidence suggesting they would abscond or commit offences whilst awaiting trial. This case exemplifies the disproportionate overuse in Greece of pre-trial detention against detainees of foreign nationality. We are convinced, as a Legal Centre that had the benefit of having legal observers present and filming the events as they unfolded, that the criminal charges brought against the Moria 35 are baseless. Nevertheless, all the 35 defendants are charged with 4 identical offences: damage to property, use or threat of violence against a public official, dangerous bodily harm and arson with intent to endanger life. What is most striking about the charges, is that there is minimal attempt made to differentiate between the alleged conduct of the individuals involved. The evidence provided against the 35 is incredibly generalised, making it difficult to discern what the alleged role of each of the defendants had supposedly been. It is as if the police could have arrested any individuals in the camp and included them on the charge sheet. 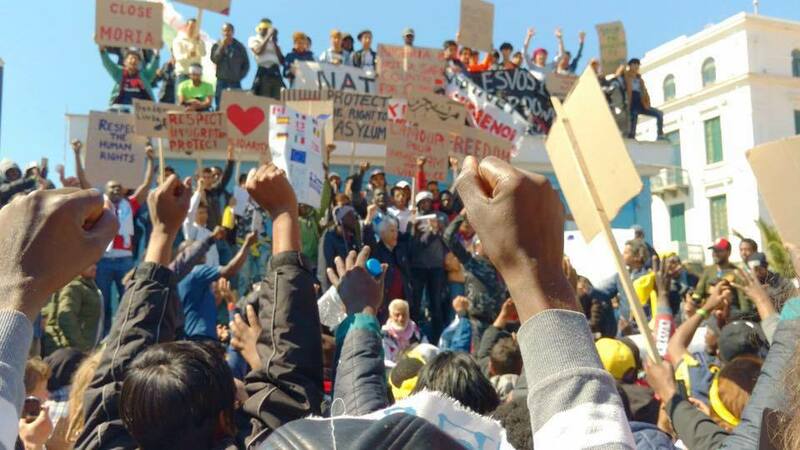 A call for international solidarity with the Moria 35 is not therefore just a call to support 35 individuals who are victims of cynical criminalization, it is a call to support a politically aware community demanding its rights.